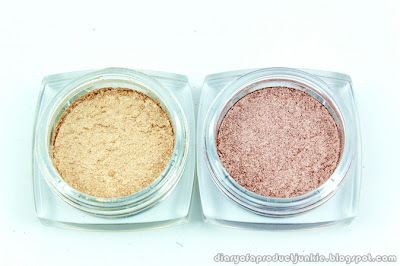 I rarely buy eyeshadows, but if I do, I tend to choose natural, everyday colors. I don't go dramatic like greens, reds, neons, etc. 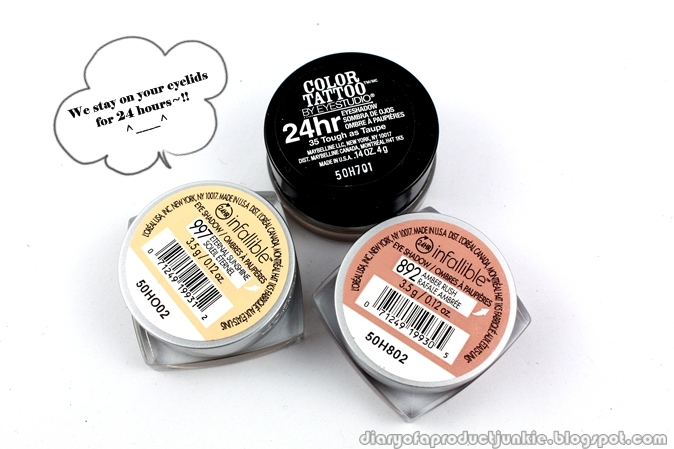 So, a few days ago, I saw Maybelline's 24 hour Color Tattoo being sold on one of the online stores on Facebook. 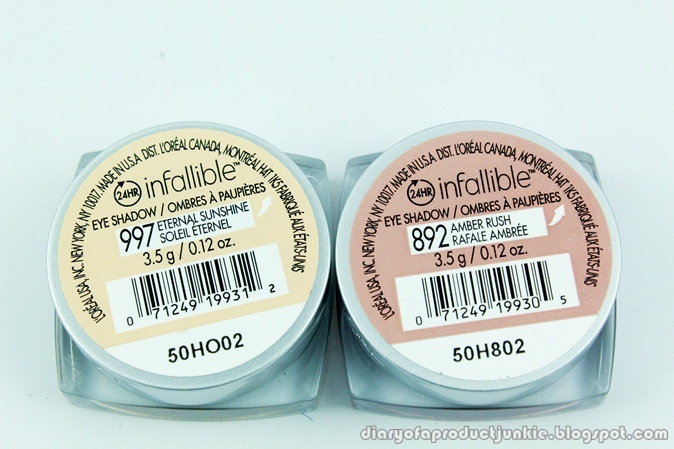 Also, I saw the L'oreal Infallible Eyeshadow in stock. 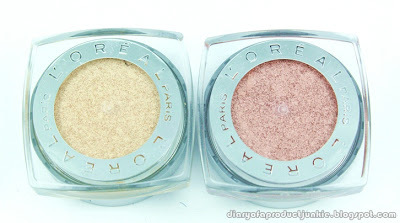 I bought one from Maybelline and two from L'oreal. 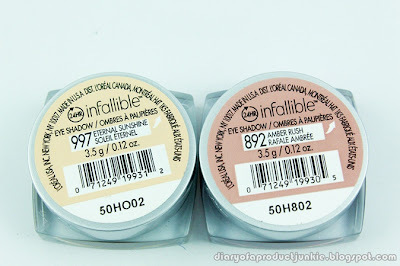 L'oreal Infallible eyeshadows are next. I choose the shade "Eternal Sunshine" and "Amber Rush" because they look work-friendly and more natural. You can see the color on the bottom of the pan, very clearly. Once I open the eyeshadow pan, there is a plastic to keep the eyeshadow from drying out, I guess. It has the instructions not to discard the platic "presser". Removing the 'presser', I can see the gorgeous, bright, vivid colors of the eyeshadow. 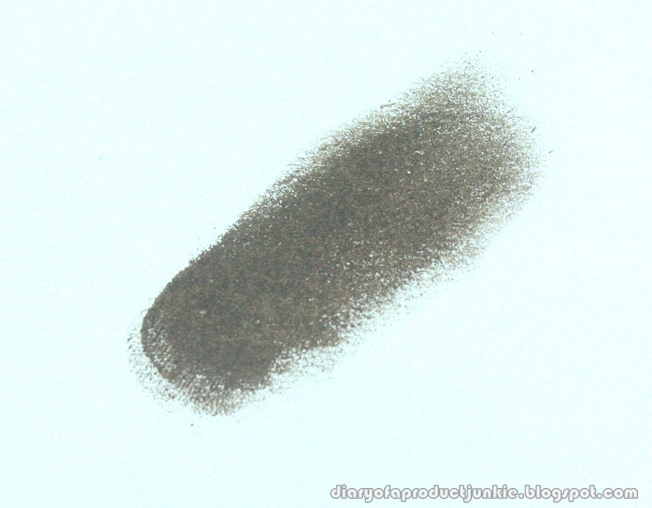 The swatches on a piece of paper since it looked better than swatched on my arms. 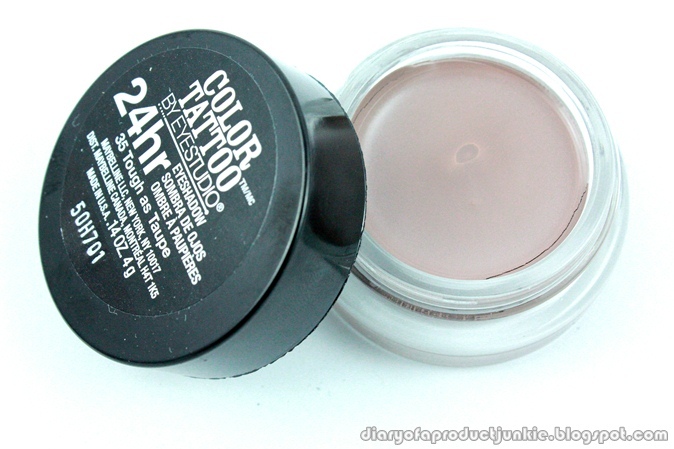 Tough as taupe nya maybelline color tatto populer banget yah, dimana2 pada ngomongin itu. btw beli si color tatoo dimana say? 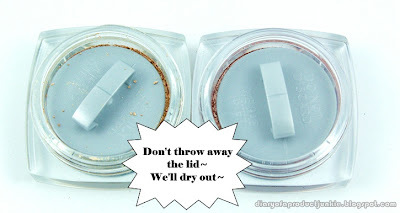 pingin nyobain juga yang tough as taupe..